Years ago after a friend and I listened to Sarah Vaughan sing her heart-wrenching interpretation of “It Never Entered My Mind,” he turned to me and said, “Well, that song’s been done now. No one else could sing it better.” His comment ran through my mind as I sampled Grossmith Floral Veil and Golden Chypre. Have the ultimate basic floral and floral chypre already been made? There certainly are plenty on the market. Do the Grossmith fragrances have anything new to add — especially at their price? Floral Veil and Golden Chypre are part of Grossmith’s Black Label Collection. (The collection also includes Amelia and Saffron Rose. Amelia has a dominant woody-musky accord that gives me a headache, and Saffron Rose deserves a true rose lover, so I’m leaving those to other reviewers.) 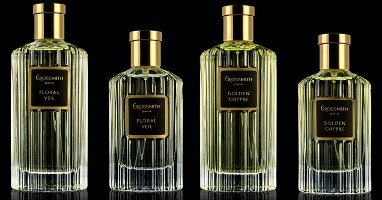 Like the other Grossmith fragrances I’ve tried, Floral Veil and Golden Chypre smell rich, condensed, and expensive, and they last forever on skin. They are Eaux de Parfum, but I can’t imagine Extrait smelling any more luxurious. But are they interesting and compelling? Floral Veil includes notes of citrus, green accord, geranium, rose, ylang ylang, tuberose, vanilla orchid, cashmeran, amber, and musk. Floral Veil starts off rosy and softly aldehydic, with a hint of creamy ylang ylang. The tuberose is part of the chorus rather than a star, and the green notes only serve to balance the scent’s fresh, subtly blended floral heart. Someone smelling Floral Veil would be hard-pressed to pin down exactly what flowers went into that spring-light veil. It isn’t long in Floral Veil’s development before cashmeran shows up and strikes a big underline to the whole fragrance. That said, the cashmeran blends beautifully with the perfume’s floral notes. Like a piece of a jigsaw puzzle, it seamlessly snaps a warm, musky, fuzzy foundation to the fragrance. Still, it’s cashmeran, and if you, like me, can’t help but think of the late 1990s when you smell it, it will shatter the Victorian dream Grossmith wove up to that point. My verdict: Floral Veil is pretty, yet non-descript, and that might be both its greatest asset and biggest drawback. If you are looking for a basic floral perfume to spritz on for any occasion, and you found Hermès Jour d’Hermès to be too thin, contemporary, and cold for your taste, and — this is a big “and” — if dropping $300 for a bottle of perfume doesn’t faze you, I think you’ll love Floral Veil. Try it. Golden Chypre (how I love that name) includes notes of cardamom, nutmeg, citrus accord, rose, geranium, heliotrope, vetiver, patchouli, amber, and musk. This list of notes makes it sound more spicy than it is. To me, Golden Chypre is a fresh citrus-floral chypre that is happy to stay in the background. The cardamom and nutmeg only scarcely dampen its citrus topnotes. Golden Chypre opens with a puff of soft, rounded orange backed by an equally soft floral heart that smells barely metallic, as if a cold, rocky spring runs through it. The perfume resonates in the second soprano range with its citrus notes buoying it above a quiet chypre foundation. Chypre lovers will want to know if Golden Chypre is mossy, and, yes, I detect a whiff of moss, but not a lot, and I had to compare it against the mossy orange chypre Parfum d’Empire Azemour les Orangers to make sure. Still, the perfume does nod toward vintages fragrances, and it smells nothing like the focus-grouped perfumes I’d find at my local department store. My verdict: We chypre lovers by-and-large consider ourselves aesthetic anachronisms, and we like our perfume to flaunt its lack of fashionableness. Golden Chypre reminds me of a musky Guerlain Mitsouko without the shadows and the peach, and, bottom line, without the character. Would I choose it above ninety percent of what the downtown Nordstrom stocks? Definitely. But given the other niche and vintage choices out there, I’d hesitate. But that’s just me. Grossmith isn’t aiming its product toward people like me who wear secondhand clothes and drive an old pickup. They probably aren’t angling for the artistically adventurous crowd, either, who demand wit with their beauty. But for their target market of well-to-do, basically conventional people who love the kind of luxury that loathes to call attention to itself, and who want no more than for a perfume simply to smell lovely, they succeed big time. Grossmith Floral Veil and Golden Chypre Eaux de Parfum are an eye-popping $395 for 100 ml; 50 ml bottles are $290. They come in a lovely fluted spray bottle that recalls the old Dior bottles. For information on where to buy Floral Veil and Golden Chypre, see Grossmith under Perfume Houses. But then, who does buy these fragrances? And in enough quantity to devote a counter space and a sales clerk? How many bottles could a shop sell in a year? Really? That many? Even when Grossmith is competing with dozens of other perfume companies and hundreds, probably thousands, of other fragrances on the floor? I was at Neiman Marcus yesterday in the city (after being back in the Bay Area now for nine years, “city” denotes SF… and not Manhattan…but I digress!!) and was astounded by how many clerks were pumping the sunshine amidst the fragrance counters… I had already visited Chanel a few blocks away (where incidentally I was given 12 perfume samples after I asked for two!) and yet at NM there was a full “wing” of the floor devoted to Chanel fragrance with its own clerk. . .I just don’t get the business model. Hi, Oakland Fresca. You have raised some very astute points, and I thank you for that. I think Angela’s comment regarding the targeted market is your best answer. We are all held sway by the allure of luxury, what is exclusive, expensive, out-of-reach. Many of us who are more “sophisticated” search out the unusual and are also victims of insidious marketing. I certainly know I am held sway! After losing my fragrance collection in a fire years ago, I recently decided to jump back in the game and I’m completely overwhelmed. I think I could certainly be influenced and, in fact, I often LOOK to be influenced by others more knowledgeable. None of the above is any news to you, just my two cents and that IS all it’s worth I can say, though, that it would NEVER occur to me to go into a Chanel boutique, or Hermes, or Dior. And perhaps that goes for the majority who go to the mall and the department store. It’s really nice to hear that you had such a positive experience at Chanel. I wonder if the SAs at the boutiques are more knowledgeable, are paid more or receive commission. It would make sense if they were, but I agree with you, it’s hard to know how this business model works. I am so sorry about your fire. What a wretched thing to go through! I also want to tell you that Sunday was the first time in my life I ever went into a Chanel store (I also visited Hermes, which was just around the corner) and upon entering I went straight to the fragrance section to test some scents I had been reading about. When the clerk asked if she could help me, I immediately apologized for my bad French and then winged it with the fragrance names. She laughed and said her French was terrible too (which it was :)) and was very helpful. The entire experience was charming, and I could not believe my luck when she handed me the neat Chanel bag full of samples! But none of this explains how enough people are willing to plop down $200-$500 a bottle on perfume, to sustain all the luxury brands, all of their new launches, and all of the elegant and polite sales clerks selling the stuff… How many bottles of $300 edp does Grossmith have to sell to break even at any given counter? It’s a good question, and one that could probably also be applied to California cult cabernets and diamond tiaras. Ah, a question I have not ever considered! What *IS* the business model for sales of diamond tiaras? Although a nice SA let a gaggle of us college girls try one on in a Neiman Marcus ages ago . . .
That sounds like fun! I wonder who ended up buying it? You’re so brave! Were you wearing sweatpants and a hoodie? My French has also languished ( since around 1980) but it’s so nice to know that you had such a wonderful experience. I’m as clueless about business as they come. Definitely there are a lot of people with a lot of money. As we all know, often the juice does not justify the price anymore, so the the cost of production is a lot lower, non? In a large venue, displays and marketing costs are sometimes absorbed (somewhat) by the store. Definitely risky business, but perhaps (?) they know what they’re doing. Or are they backed by silent partners? I don’t know. And those elegant, gorgeous SAs? Most likely minimum wage. Yikes! If my perfume collection caught fire, I’m afraid it would turn into a fireball and take out half the block! Well, Angela, it WAS a large fire. And, um, it DID take up half the block in Brooklyn. Hmmm…..
Gosh I’m so sorry about your fire. That’s heartbreaking. How’s the perfume collection rebuilding going? I can totally imagine the sense of overwhelm. I hope you’ve found a few fun things at least! I’m glad you had such a great experience at Chanel! I don’t think I’ve ever been in an actual Chanel boutique. I did once buy a scarf at an Hermes store a long time ago, and that SA was so sweet and kind that I still get a warm feeling thinking of how nice she was to me when she probably had lots of customers ready to drop thousands of dollars. I think you are exactly right, there is a strategy to pricing a product beyond the reach of many to make it be perceived as more luxurious. In my opinion, perfume is a luxury, but should be an affordable luxury in line with the way Estee Lauder markets their fragrances as everyday items. And it’s always nice to know you can often find perfume gems at drugstores, too, with a little effort. It’s so great to hear about your positive experience at Hermes. So often we love to disparage SAs as being inappropriately elitist, and I’m definitely a victim of that mindset. However, it’s good to know that isn’t always the case, and I look forward to expanding my horizons! She was probably one in a million, but she was terrific. One in a million is fine by me! This sounds great! I hope it’s what you wanted! Maybe buy a lotto ticket, too? Diagonal? That’s not ringing a bell for me, but $4 for Diorissimo is definitely worth taking a risk on. Good luck! http://i.ebayimg.com/t/Vint-60s-Christian-Dior-Diorissimo-edt-Perfume-URN-shape-rigged-bottle-3floz-90m-/00/s/MTI4MFg5NjA=/z/MgUAAOxy3NBSiSbI/$_12.JPG Altho as I think about it, I guess the box might verify the date? I really don’t know the Dior vintages well enough to know. It sure looks legitimate, although the EdT is awfully dark–hopefully it isn’t oxidized. If I had to guess on date by style of packaging alone, I might say late 1970s, early 1980s, but that’s purely a guess! Good news, that’s just a matching bottle I found online, the juice in mine is much lighter (although sadly also much less full). But hopefully it’s ok! Interesting about ’70/’80s. Thanks so much for lending your vintage expertise! Now regarding the Chanel samples at Neiman Marcus, here’s the reality, plain and simple: Samples of fragrances do cost money and are handed to a store for free only at launch and in scarce quantities. Some stores who have the very high profit margin (N-M…) actually continue to purchase more samples. That’s why they are perceived as generous because they usually hand you a sample for the asking (unless you intentionally walked in looking like a homeless person that day!) Other stores like Macy’s and that category only stock samples as they are “given” to them for free upon placing an order. Once a scent is past its initial launch period and the sample batch is gone, it’s really gone! Now there’s also an added element to that: Those same sales people at Macy’s and the likes “keep the samples” sometimes for other purposes. Like for themselves or occasionally as “treats” for those customers that buy a large number of fragrances all at once. So that’s why those stores come across as non-generous. Hope my blabber helped shed some light. I’ve started carrying my own sample vials, so that in cases where I’d love a sample, sometimes the SA will let me make one. It works for me! I love the name ‘Golden Chypre’ as well. But I think I already have one, if you count 24 Faubourg as a chypre. And it has character, no? I paid about $65 for my 30mls, including shipping. I think you got yours via Our Lady of the Thrift Shop, Angela? Yes, I was lucky enough to score a partial bottle at a thrift shop! I think of YSL Yvresse as a “golden” chypre, too. A couple of the the MDCIs feel golden and mossy, too. I understand Amouage frags being so expensive because they use the best, most expensive ingredients – and you can tell. But to pay $300 for something with a big synthetic note like cashmeron, wha?? If it helps, the fragrances do smell expensive to me! I’m sure I often smell more moneyed than I actually am! As long as you’re enjoying it, why not! Thanks for that, Eric. I was wondering if the UAE might be at least a partial answer to the question. Yes absolutely. And not only the UAE, but also Qatar, Oman and Saudi Arabia. So the entire Gulf countries. And the rest of this very well-made BBC Documentary called BBC Perfume Episode is truly eye opening – Re Grossmith and other aspects. I second the recommendation of the BBC Perfume documentary! You can watch them in 15 minutes bites on YouTube. The Grossmith bit is fascinating, and they seem like really nice people. The part about perfume focus groups in Brazil was interesting, too. Reminded me a little of your beautiful review article of my very own favorite Mystere de Rochas! Look forward to reading more reviews from you. It would be fascinating to see how sales of truly luxury perfumes like this break out. Grossmith is still interested in publicity, so they must be hoping for sales outside of the Middle East–but I wonder how much sells and where? I really don’t know if their “anchor” scents like Shem El Nessim will succeed outside markets like the Middle East. That’s why they are probably launching more contemporaries with enough “vintage” flair like the ones you reviewed. Were you able to watch that “broker” say “this is the perfume out your great great great grandmother” without cringing? Very interesting point about the types of fragrances they’re choosing to release and where they might have greatest sales. And, yes, I did cringe a little! Wow, are there really people who consider Jour d’Hermes “cold” and “thin”? As for the money, well, I often think about how, if someone where to give me $XYZ dollars (preferably at least three digits!) to spend on anything, it would disappear fastest on perfume! Maybe not all the way to thin, but sheerer than I’d like, and a bit cold, yes. I know, I know FWIW I do think it’s very pretty, just not my thing for aforementioned reasons. It’s certainly more contemporary, although classical at the same time–sort of like a stylized painting of a bouquet of flowers fuzzy enough that you can’t really identify them individually. Compare to Floral Veil, it’s definitely less warm. I had forgotten about this when we had the perfume regrets poll, but ca 2008-2009 when I was regularly prowling ebay in search of vintage perfume, I would occasionally see a pristine Grossmith in its colorful packaging. I’m not sure why I never bid on one of them, as I often did take chances on unknown perfumes that looked interesting. They would have been bargains compared with the recreations. Wow! It would have been fascinating to compare the old and new, too, in terms of style.